P90X3 Results: This Dad Lost 40 Pounds in Just 30 Minutes a Day! 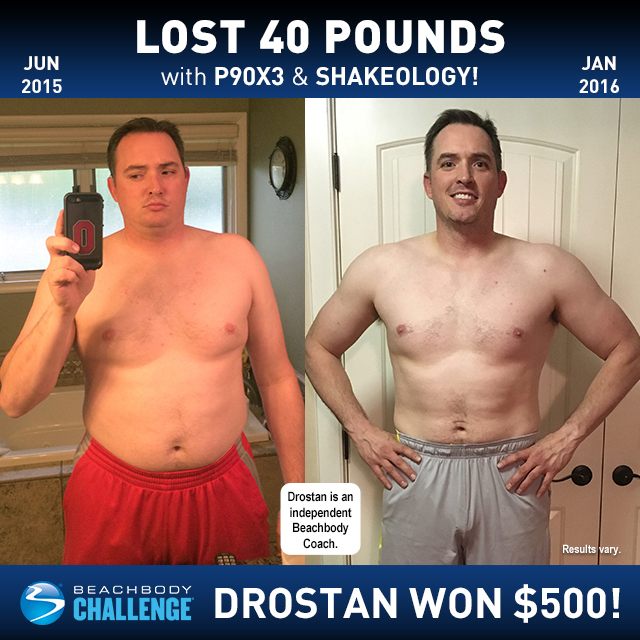 Drostan Orme lost 40 lbs. with P90X3 and Shakeology. He entered his results into the Beachbody Challenge, and won the $500 Daily Prize for April 29th! I felt embarrassed that I let myself get so out of shape. How could an athletic person let themselves go? My knees and back were always hurting, and I had no drive or desire for physical activity; totally the opposite of who I am. I found myself avoiding activities with my kids and even avoiding the activities that I loved to do for me. It was either because I was too winded, physically couldn’t do the activity, or was too tired or sore to participate. I think that the biggest challenge was facing reality: I had done this to myself. Realizing that it was in my power to change and deciding that I could change, and thereby take control of my life, rather than be a victim of life, was really difficult. It was medicine that I gave to friends and family who needed it, when they needed it. But it was really hard to force myself through that self-reflection process and to admit my responsibility for my situation. I loved that it was 30 minutes a day and that the workouts were varied. I was proud of being able to fit into clothes that I hadn’t worn in a while. I was proud that I looked forward to activities with my family rather than avoiding them. I was proud of the pounds of fat lost and the muscle gained. Even when my weight loss stalled, my body continued to transform, shrink, and tone up. Danny was always available to answer my questions. We talked about doing this almost a year prior to starting it. I am so glad Danny had the courage to start and the courage to invite me to start. He provided networking opportunities with his Coach, David Ingram, and motivated me even if I was frustrated. He has always been a good friend of mine. But during this journey, he was positive and supportive, and made me believe in myself.